service. Her warmth, sincerity and attention to detail help establish a fundamental trust among her clients. Her outstanding negotiating skills and her belief in the strength of effetive marketing have continually propelled her above the rest. She continues to set new standards for success through her unwavering focus, exemplary dedic... more.ation and unrelenting determination to exceed her clients' needs. Suzan has distinguished herself as a savvy marketer who understands the importance of attracting the right buyer for the ideal residence. 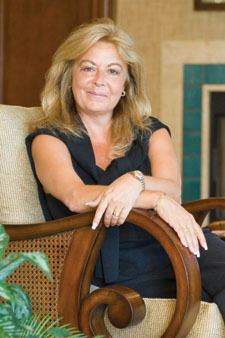 Knowing her clients and her market, she continually sets benchmark sales records in Sarasota luxury real estate. Suzan is tremendously grateful for the opportunities and success she has experienced in luxury real estate sales. Professionally, she gives much credit to her relationship with Michael Saunders. Michael's philosophy of ethics, integrity, respect and client confidentiality are foundational elements embodied in Suzan. Those key attributes are reflected in every relationship, every transaction and have become a trademark of service excellence. “We have it all here. I can't think of a more idyllic community in which to raise a family, establish friendships and experience Florida living, than Sarasota.” ...less.